B. And I wanted to really share all about how the famed Myeongdong Gyoja came to be and continues to thrive after decades in the business. If you've had a friend who has been to Seoul at all before, there's a high chance that he or she dined here at one point or another. Covered by so many guide books and blogs abroad, I'd daresay Myeongdong Gyoja has become a near rite of passage for visitors to be able to say they've actually been to Seoul. And while the long lines at both the original and second location in Myeongdong (both located just a few hundred meters from each other) may give the impression that this is a touristy joint, look carefully and you'll see that more than half the clientele on a regular basis is comprised of locals. That is to say, it's that famous and sought out by locals just as much as visitors. As the restaurant makes known, Myeongdong Gyoja traces its history back to 1966 when it first opened in Suhadong, near the portion of Cheonggyecheon Stream that's between Euljiro 1-ga and Jonggak stations, under the name "Jangsoojang". The restaurant's signature kalguksu did not happen by chance though and was a result of many historic factors at the time. 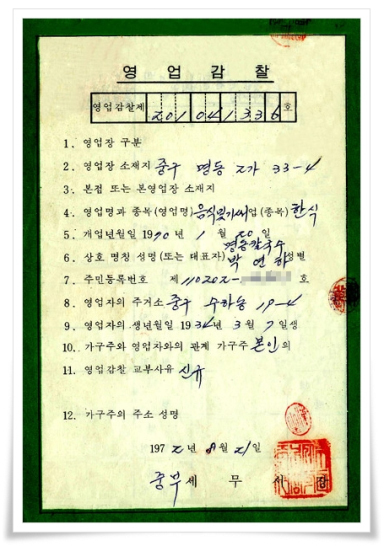 In the 60's there was a rice shortage in Korea to the point that school children had to bring barley (instead of rice) for their lunch boxes and restaurants were even banned from selling rice or rice-based food on certain days and hours. At the same time, flour was steadily growing in popularity since its mass importation from the US following the Korean War. Developing their own recipe using a chicken stock-based soup and adding its own distinct flavor to the dish with their pan fried onion, squash, etc, their beloved kalguksu was a hit from the beginning. Not too long after, in 1969, the restaurant moved south to Myeongdong, which was already a major central district of Seoul at that time. Records show that a year later it registered and changed its name to "Myeongdong Kalguksu". The taste and popularity soon sparked numerous imitators to open up shop- all under the same, or similar, moniker. Later, these imitation restaurants were opening up not just in the vicinity but around the nation, all with the same name but with no association with the original. What was worse was that these copycat shops were cutting corners in quality and taste to the point the "Myeongdong kalguksu" was becoming associated as a cheap, low-quality food. Having no other choice to save their reputation, the restaurant would undergo its third and final name change, registering the "Myeongdong Gyoja" name in 1978 which is what it still goes by. This last name change wasn't without major confusion for its diners and there are still older generations of locals here who refer to this restaurant as Myeongdong Kalguksu. The restaurant still emphasizes heavily that the two restaurants in Myeongdong are the only Myeongdong Gyoja in the entire nation and that any other with even a remotely similar name is completely non-associated with them. So that's the long and illustrious story behind the restaurant but all this is to say that they must be doing something right if they've been so beloved for decades. At either the original store or the second location, you'll encounter lines during peak meal times. Luckily, after decades in business, they've got the whole system down where an usher near the entrance will let you know where to go for your table after you let them know how many are in your group. Menu is also kept simplified with only two options: kalguksu and mandu (dumplings) although there is a seasonal kongguksu (cold soybean soup noodles) for summer. Kalguksu sets you back 8K while a plate of steamed mandu is 10K. The popular order is for each individual to get his or her own bowl of kalguksu while splitting a plate of mandu. To help speed things up, Myeongdong Gyoja is one of those rare joints in Korea where you pre-pay. It makes sense for a busy restaurant like here and all the more smart of them to keep menu offerings simple so that almost all returnees basically order and pay within seconds of sitting down. And just as fast as it takes to order and pay, the food is brought out including the infamous garlicky kimchi. Let's start with the kalguksu which is already distinctive for its brown-ish hue. Most kalguksu comes in a rather white-ish or opaque hue but here the caramel stock is a testament to the rich broth. A generous mound of noodles sits in the soup which is topped with ground pork, some chives and four half-moon dumplings. The soup is unabashedly meaty, not to the point that it's overwhelming, but there's a depth to it that doesn't come from just casually throwing some chicken into a boiling pot. But lest it should be known as simply chicken noodle soup, the broth has a dimension of smoky earthiness that comes from the pre-pan cooked onions and squash. The sweated vegetables adds both a natural touch of slight sweetness and an extra layer of flavor. The noodles appear rather limp on first glance but they still retain their elasticity and bite which is another testimony to the restaurant knowing exactly how long to cook its noodles. The generous scoop of the cooked ground and seasoned pork adds extra flavor and a contrasting texture to the noodle soup. On a scale of the depth of flavor for kalguksu restaurants, Myeongdong Gyoja stands firmly on the stronger end. It's perhaps fitting then that their famous kimchi packs quite a punch to hold up to the noodles. Actually, what's served here isn't kimchi but "geotjeoli" which is basically a less or non fermented kimchi (this is commonly served with bossam for wraps). But the geotjeoli has a trademark heavy-handed seasoning of minced raw garlic and chili flakes to stand off against the rich broth. That isn't to say the geotjeoli here doesn't have its antifans. Its copious and pungent amount of raw garlic probably isn't the best before a date or important meeting but for its fans you'll see them asking for refills of it by the bowlful. The dumplings that comes with the soup is essentially the same as the separately ordered mandu but different shapes. Interestingly it was this half-shaped mandu found in the soup that was first released in 1977 which helped give the restaurant its name when it made the switch in title to Myeongdong Gyoja in '78 (gyoja is the Japanese word for mandu). In '83 their round shaped mandu was released which is the shape of how the plate of mandu comes out today. Both forms of mandu are different from traditional Korean mandu in that the wrappers are extremely thin. It's to the point that the mandu is nearly opaque with the filling clearly showing through. The dumpling are about thumb-sized so they're not incredibly big but they are packed. Unlike the thick-skinned North Korean style mandu where you're almost eating a half-half ratio of dumpling wrap and filling, here the wrap is almost non-existent. The filling is heavily meat-based with just diced chives and other seasonings making up its composition. Ingredients like glass noodles, tofu, soybean sprouts, etc are all non-existent here making it a fan favorite mandu for meat-lovers. And at 10 pieces for 10,000 (or 1 for 1,000) they certainly aren't the cheapest but for carnivores, it's probably one of the best-value mandu you can get find. So with overall great-tasting food it's easy to see why so many would be fans of the food here but certainly there are two other factors that have contributed to the restaurant enjoying its legendary status. First, the use of high-quality ingredients which are all Korean-sourced. As the menu says, the restaurant only uses Korean-based ingredients (from chili flakes to pork and the flour likely being the only non-Korean ingredient) all year-round. And all food that isn't consumed on the day it's made is discarded and made again the following day. Second, while the prices are already reasonable and portions filling, one has the option to order more noodles or rice, to his or her heart's content, during their meal. There are stipulations to this such as the rice and/or noodles having to be ordered after you're done with the rice/noodles you've already been given but this makes it a great value for patrons, particularly those with a bigger appetite. I am admittedly a "born again" believer of Myeongdong Gyoja. I used to have it on and off while visiting Korea and then last had a 5 or so year stretch where I didn't have another bowl until last year. It's from that long period away and then coming back I realized just how commendable Myeongdong Gyoja is for its commitment to quality and taste. There are so many restaurants out there that specializes in dishes that are slight variations of others. But the variety of kalguksu offered here has no equals, no matter how many restaurants around the world have capitalized on the name. Myeongdong Gyoja will forever be Myeongdong kalguksu and you can bet 50+ years of history on that. 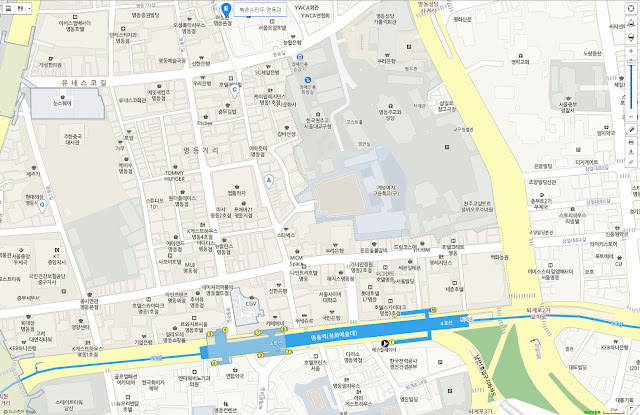 From exit 8 of Myeongdong Station, immediately turn left and walk north along Myeongdong 10-gil for about 160m and you'll see the original location on your right. The second location is located on the same street just about 100 m north of the original location. Rice and additional noodles are free if you ask for it!